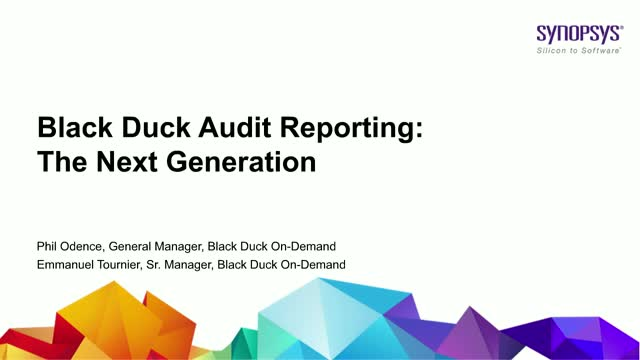 You won’t want to miss this webinar, if you have received Black Duck audit reports and anticipate more in the future. Black Duck by Synopsys constantly strives to improve our offerings and reporting capabilities. We’ve expanded the range of our audit offerings, and by the first of the year, we’ll be rolling out a new set of reports and a new process for sharing them. Join us for a preview of the new reports and process. Black Duck On-Demand’s Phil Odence and Emmanuel Tournier will demonstrate how we have combined customers’ ideas with the best elements of our reporting to develop new reporting technology and processes designed to make reviewing audit results easier, more insightful, and more productive. - Run in the background and report vulnerabilities during functional testing, CI/CD, and QA activities. - Prioritize and triage vulnerability findings in real time with 100% confidence. - Fully automate secure code delivery and deployment, without the need for extra security scans or processes. - Free up development and security resources to focus on strategic or mission-critical tasks and contributions.